It is interesting also because it contains his ‘last’ photograph – or at least so Olive believed until I discovered a roll of unprocessed film in a camera of Edwin’s that she later gave me. That ‘last’ photograph, of Canterbury, is reproduced to accompany the text below. 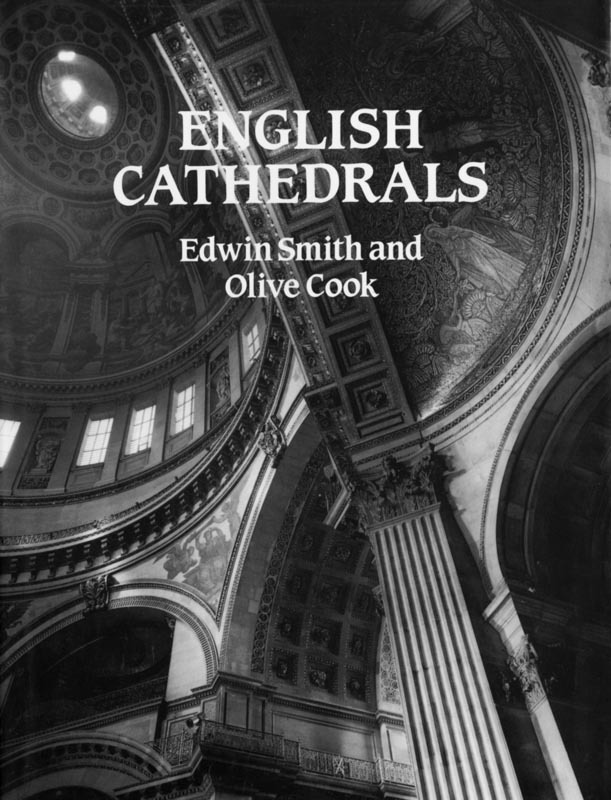 In the 1971 re-issue of Edwin and Olive’s first collaborative book, ‘English Parish Churches‘ (originally published in 1952), Olive included an article that Edwin had written about his experience of photographing in cathedrals and churches. This text forms the main body of this page. 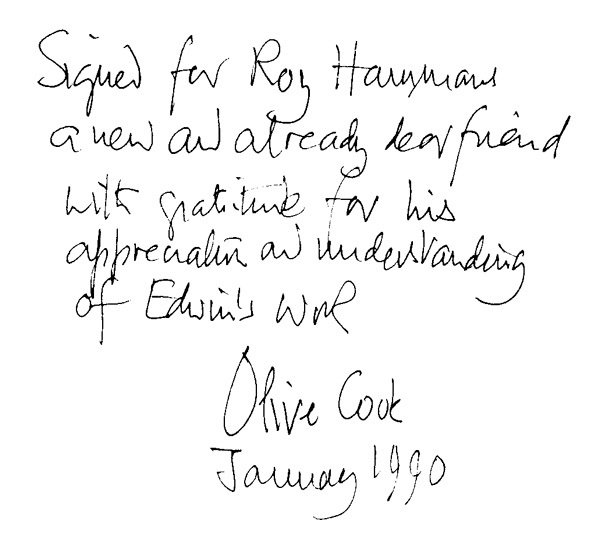 In the considerably revised and expanded reprint of ‘Parish Churches‘ of 1971, the detailed architectural drawing that Edwin devised to illustrate the evolution of the English church was also reproduced. I have included it here not only because of its interest but also to show that he was indeed a very competent architectural draftsman, as befits his training as an architect. I arrive looking as much as possible like any other visitor, equipment discreetly satchelled and not draped around my person. Taking the ﬁrst opportunity I dump bag and tripod beneath a bench, behind a pier or on any obscure stone ledge or underneath the collecting box table. 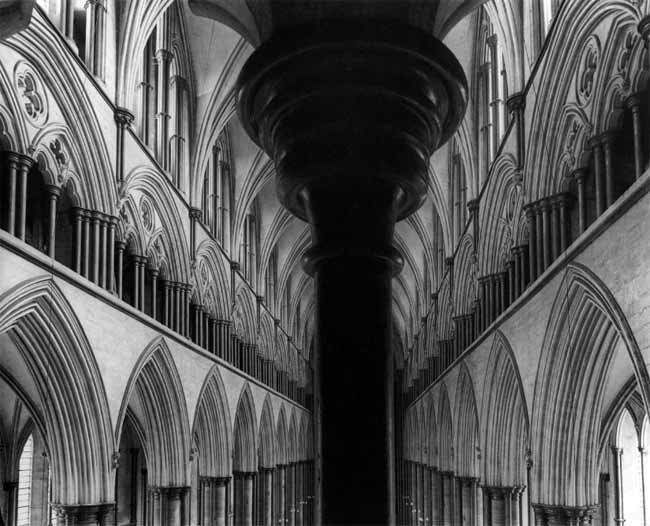 A cathedral is rather like a railway station in its number and variety of crannies of this kind (though very unlike of course in the conﬁdence it encourages that what is left will remain against one’s return). An image arises of this bag as the last deposit on a ghostly pile of travellers’ bundles that have been left in such crannies over a minimum of 500 years, and with it the realization that one’s mind is starting to digest the atmosphere. It is probably 9 a.m., and the verger may be ringing the bell for Matins; soon a tiny file of clergy will advance from the vestry off the south choir aisle and, making two slow right- angled turns, pass into the choir. I am conscious of a certain reluctance at not supporting them, but I have come to worship with the eye and to give other kinds of praise. As I tread softly in another direction the thin monotone of devotion heightens my reactions to the vistas around me. If I am lucky the morning is clear but not sunny, or if there is sun it is weak or frequently screened by cloud. For in this preliminary stroll I am rehearsing for the camera and thinking of its peculiar needs rather than of the immediate pleasure of the more adaptable eye. Brilliance and great contrast, delicious to the eye, are disastrous to the photographic process, and I am seeking the vantage points that not only compose in terms of form but where the range of light and shade falls within the scope of the film. Every photographer favours a particular direction of light: I am drawn to situations where the source of light lies diagonally in front of me and not behind. To this direction I react instinctively and I gravitate without conscious design to those parts of the structure where this light obtains. These parts of the building I sense are ‘working’ for me, but they will of course rapidly be replaced by others as the light moves round. So, having received the suggestion of a number of possibilities that make me excited to begin, I retrace my steps. By now Matins will be over, the sparse ﬁle of devout will have returned to the vestry, the verger, having removed his surplice, will be found in black habit not far from one of the great piers of the crossing. Explaining my purpose to him — signing his book, paying a fee, producing a letter of permission from the Dean and Chapter, whatever the circumstances demand — I get permission to begin.